It’s hard to quantify a miracle. One person’s miraculous healing is another person’s mind over matter. It’s difficult to explain these miracles (that’s why they’re miracles), but sometimes the explanation of the miracle makes them even more miraculous. 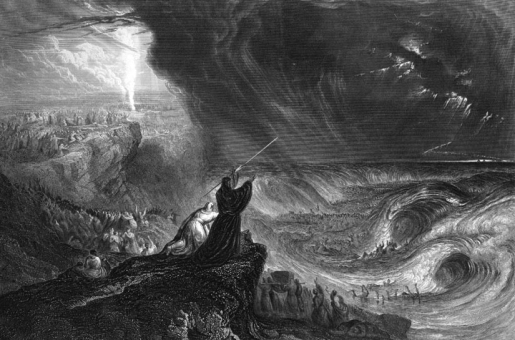 Carl Drews, a researcher at the National Center for Atmospheric Research, has taken an interest in Moses parting the Red Sea from the book of Exodus in the Bible, and Drews has put together a computer model to explain just how the Red Sea was parted. The area studied by Drews is more befitting of the name ‘Sea of Reeds,’ as even today the area is very reedy. More importantly, it runs north/south, rather than the east/west of what we now call the Red Sea, which means the eastern-blowing wind described in the Bible would be able to part the lake, exposing solid ground for the escaping Jews. It would have taken a sustained 63-mile-an-hour wind to part the seas, which means the miracle wasn’t the gale, but the fact that the Hebrews could stand up to that buffeting breeze! This is what happens when you’re on a mission from God.